There's a day to celebrate pink??? We better tell our human sister! You look so pretty with pink, Allie, but where are your pink toenails? 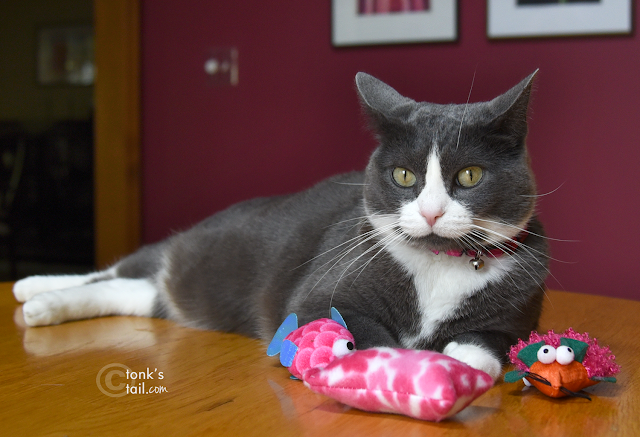 Those are very pretty new toys, Allie! Those look purrrfectly pink for you! Pink is totally your color, Allie. Your pretty grey furs looks perfect with the pink! Fashionable and fun! Pretty in Pink on Pink Day Allie! Rock on gurrfurrend! I love your pink toys and it is perfect for Pink Day! Those ARE some pawsome good toys Allie. *marks calendar for next year* now I will never forget..
Allie, those are great toys- where are your pink nails though? Your toys are adorable. I bet my kitty sis Sophie would love those, but since cat bro Bert eats all toys, we can't have any cat toys. 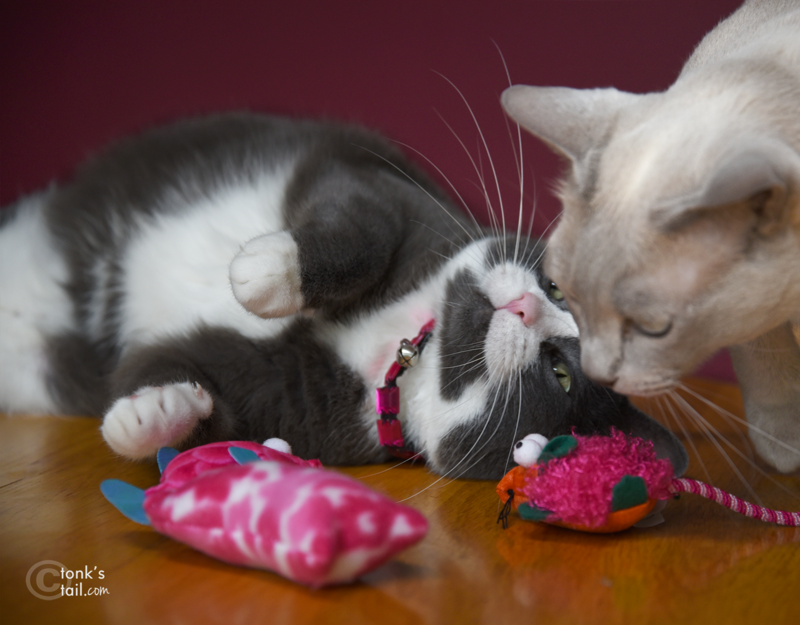 You have some pretty awesome pink toys! lucky girl! Those are pretty toys Allie. Your brothers had better beware. wait...there's a day to celebrate PINK????? Mommy is so sad...she would have taken the day off to celebrate. Happy Pink Day, Allie! Have fun with your pink toys. They look like fun. Lady cat does like her pinks! A Pink Day?? 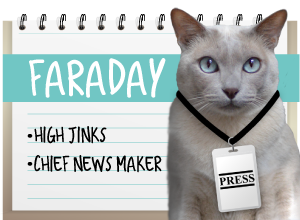 Now we have heard it all, MOL! 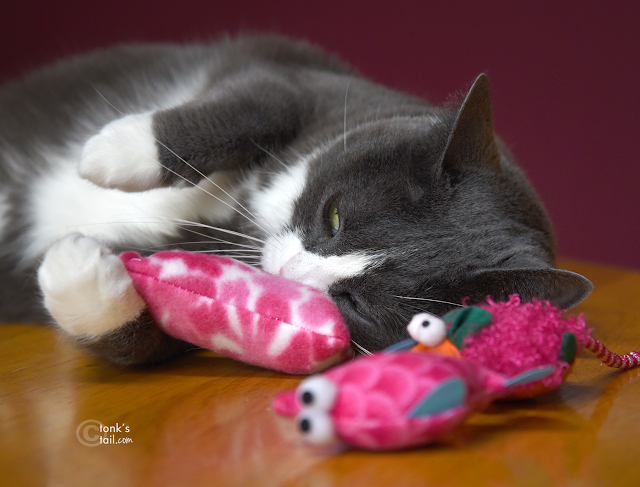 You look so furry sweet with your new pink toys! 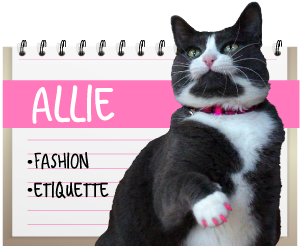 Pink is my favorite color, too, Allie! Such pretty toys. Boys are not allowed to drool on them ! Oooo, is that long pink toy from the Island Cats? Our mommy brought us one like that from their mom at BlogPaws. We love it too Allie! 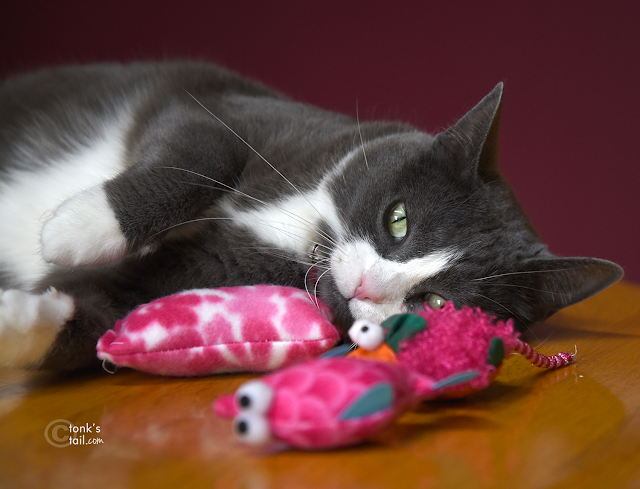 Allie, you're so beautiful with your pink toys. 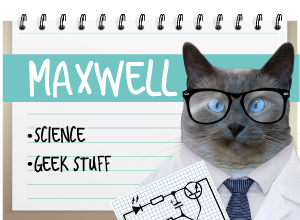 They complement your pink nose.